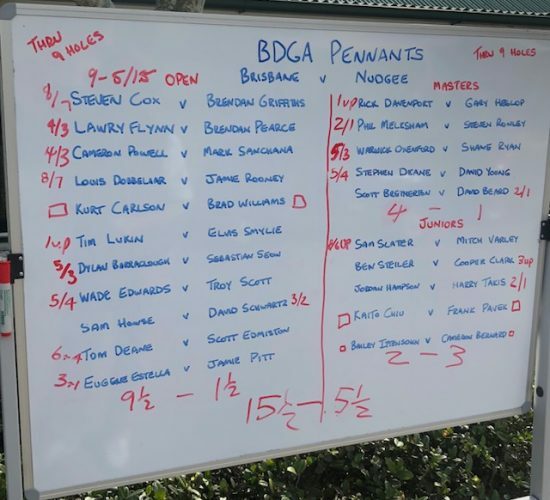 The Brisbane Golf Club recorded another strong win yesterday defeating Nudgee Golf Club in Round 2 of BDGA Division 1 Pennants. Our Masters and Opens set up the win only losing 2.5 matches out of 16 whilst our Juniors fought hard against a very strong opposition but narrowly lost their match 2-3. The final result overall was 15.5-5.5. The performance of our Opens was one our finest in many years with only two matches going to the last hole. Stephen Cox and Louis Dobbelaar both won by 8/7 whilst Tom Deane also won convincingly in his return to the team 6/5. Other winners were Lawry Flynn (4/3), Cameron Powell (4/3), Tim Lukin (1up), Dylan Barraclough (5/4), Wade Edwards (5/3) and Eugene Estella (3/1). Kurt Carlson squared his match. Our Masters started slowly but their quality and experience at home showed in the end securing an impressive 4-1 win. Stephen Deane and Warwick Oxenford both recorded strong 5/3 wins whilst Phil Melksham recorded his maiden win in the Masters defeating Steven Rowley 2/1. Rick Devonport playing at number 1 won his second consecutive match 1 up. It was disappointing not to see the match up in the Juniors between Sam Slater and Elvis Smylie from Nudgee Golf Club with Elvis promoted to play number six in the Opens. This match would have been a highlight of the day and maybe in the return fixture it will eventuate. Slater won his match 8/7 yesterday against Mitch Varley who replaced Smylie at number one. Both Bailey Ittensohn and Kaito Chiu squared their matches. Nudgee Golf Club are multiple winners of the Division 1 title and a team which BGC has strong respect for. It’s always difficult for a team to play its first two matches away and with three of their remaining four matches at home there’s little doubt they will be in the mix at the pointy end of the season. BGC remains the only defeated team after the first two rounds with Royal Queensland Golf Club bouncing back from their lost to BGC in Round 1 to defeat Keperra Golf Club 13.5 to 7.5 at home. Next Sunday BGC will host RQ with the first matches teeing off at 7am. The support BGC has received from Members so far this year has been wonderful and once again we encourage Members to come out to what will certainly be one of the matches of the season. 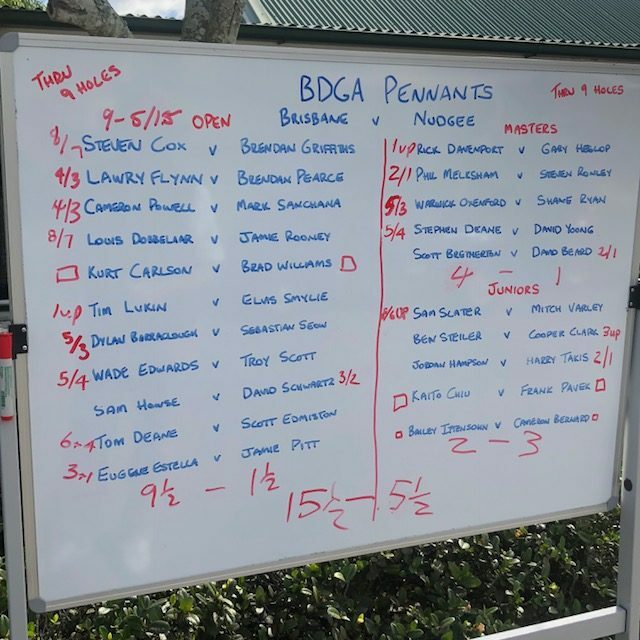 A win for RQ would not only square the ledger against BGC but also get them back in the hunt to win the BDGA Division 1 pennant. Team selections will be finalised early this week and announced on Tuesday.